Leftover Pie? I can already hear you saying, “What? I’ve never heard of such a thing!” I know, I know, leftover pie is a rare gem. 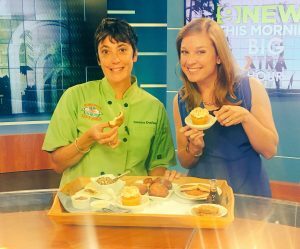 It is especially rare if you live in Baton Rouge and get your pies from City Pork Kitchen & Pie! Major Yum-my place to go for when I’m craving a slice of pie, or two…especially, if my craving leads me to wanting some of these leftover pie treats. 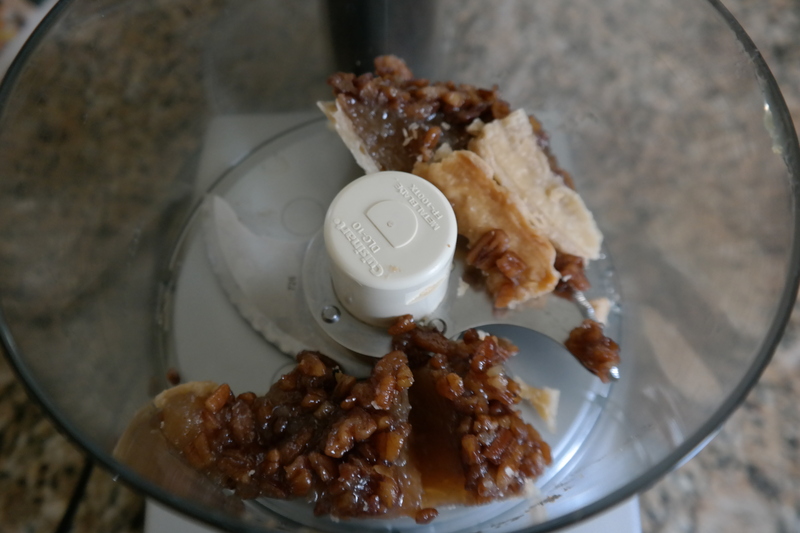 Put slice of leftover pie into a food processor (I know crazy, but trust me!). 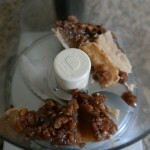 Today I’m using pecan pie since it is, after all, National Pecan Pie Day! But this works well with just about any pie-fruit, custard, cream, pumpkin, key lime-you name it. 2. Mix with cream cheese for bagel spread. 3. 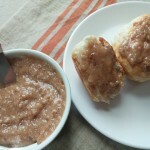 Blend with butter for spreading on hot muffins or toast. 4. 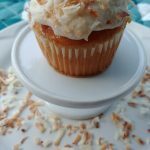 Use as a filling for baked cupcakes or topping for pound cakes. 5. Stir into ready-made frosting or into icing to frost cupcakes or cookies. 6. Whip into heavy whipping cream or mascarpone cheese as a filling for crepes. 7. Mix into pancake or waffle batter. Then whisk pie puree into maple syrup for drizzling pancakes or waffles. 8. Use as is for a biscuit spread. 9. Use as topping for Baked Brie Cheese. 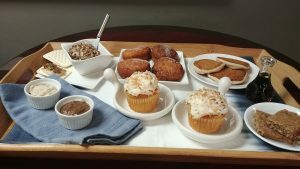 Pecan pie is my favorite for this, but peach and apple are my next favorite ones. Simply spread puree on top of brie. Add chopped nuts, if desired. Bake at 350* until cheese just begins to melt. Spread on crackers. 10. 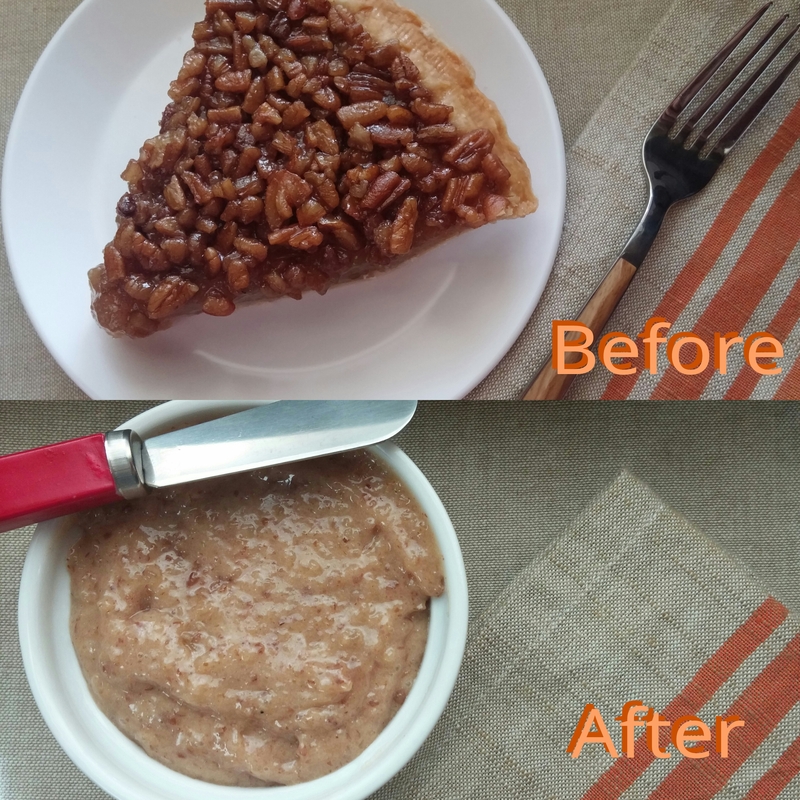 Mix pecan pie puree with brown sugar and chopped pecans. Use as crumble topping for your sweet potato casserole or carrot soufflé. 11. 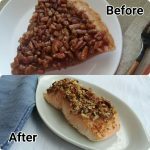 Make PECAN PIE SALMON: Yes, you can have pie for dinner! 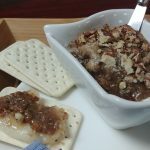 Brush salmon fillets with maple syrup, spread pecan pie puree on top, sprinkle with nuts and brown sugar. Bake on parchment lined baking sheet for 400* for 10 minutes per 1 inch thickness. Not a salmon fan? Try it on baked boneless chicken breasts! 12. 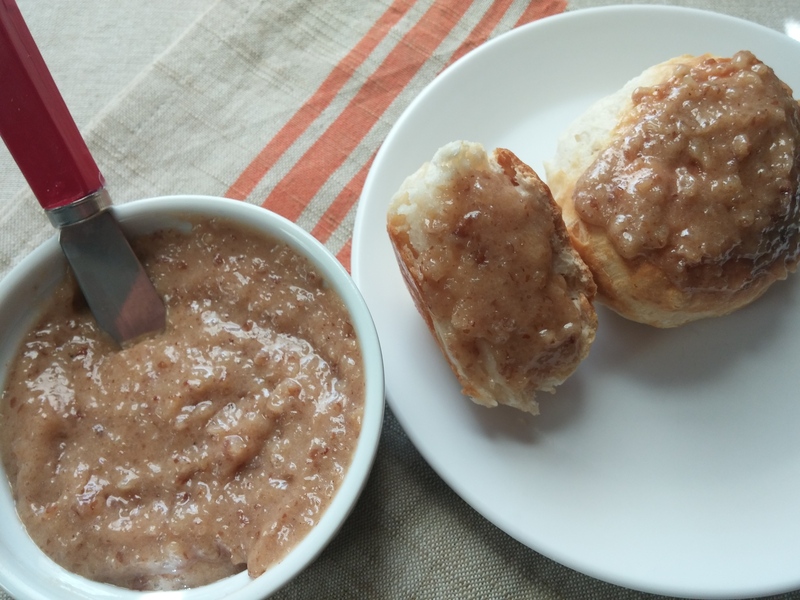 Use fruit or nut pie puree to make Muffin Oatmeal Bars Simply substitute 1/2 cup pie puree for the muffins, use 1/4 cup nuts, and omit the dried fruit. 13. Make my favorite- PIE FILLED DOUGHNUTS! Think cream puffs. For these I love to use the custards or creams pies. But use your favorite. Mine-chocolate cream pie-makes the doughnut taste just like an éclair! Use refrigerated biscuits (I prefer not to use flaky). Separate biscuits. Deep fry until brown-1-2 minutes. Roll in sugar or powdered sugar. Poke hole in a side of the doughnut. Fill pastry bag fitted with a small decorating tip with the pie puree. (No pastry bag? No problem, just fill a Ziploc bag and snip one end off.) Fill the doughnuts. Delicious enjoyed warm. Refrigerate any leftovers and warm 10 seconds in the microwave. 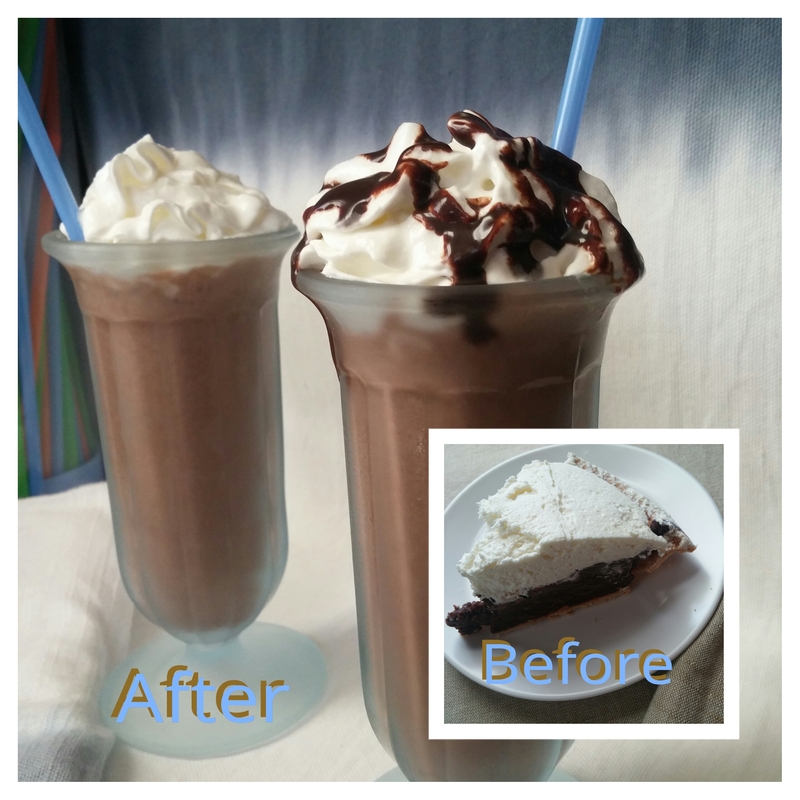 I’m using chocolate cream pie with vanilla, chocolate, & caramel swirl ice cream. Works well with just about ANY pie! Here’s a quick guide, but amounts will depend on your preference for a thicker (more ice cream) or thinner (more milk) milkshake. Put 1 slice of pie in blender, or use pie puree. Add 3 scoops softened ice cream (let sit a bit to soften, not melt) and 1/4 cup milk. Process until smooth or until desired consistency. Put your To COOK is TO CREATE thinking cap on: Let’s talk milkshakes. Think of how many different combinations that you can make with different pies and ice creams. Some thoughts to get you started: sweet potato pie & butter pecan ice cream; apple pie & caramel swirl; pumpkin pie & pralines and cream; pecan pie & chocolate fudge (like a chocolate fudge pecan pie!) What pies might go with coffee, cookies & cream, chocolate cookie dough, or mint chocolate chip ice cream? One I enjoy is pecan pie and French vanilla ice cream using eggnog instead of milk! Think about what else can be put in the blender with the ice cream, pie, and milk for added flavor-nuts, syrups, extracts, spices. The same is true when making the “pie puree”, think about what flavors would compliment the pie? Maple syrup? Caramel? Bourbon? Kahlua? What other uses can you think of for the pie puree? Ask my mom, and she would say, just give me a spoon!